You might have seen the news last week that I picked up a rather unique license plate, which reads as GOOG +1, a shortcut highlighting not just Google+, but the +1 button you find throughout the web, including here. 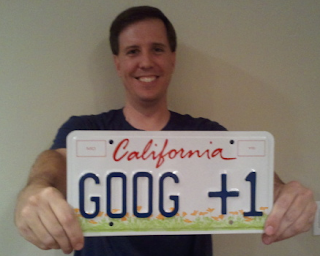 While we at the office often talk about Google+ being a good representation for how we share in the real world online, in my own silly way, I like how the GOOG +1 license plate reflects in real life how I share on the web. See what I did there? When I debuted the new plate, grinning, the reaction was split two-fold, between those who thought I was a goofy fanboy and those who appeared jealous they hadn't thought of it themselves. After all, I only joined Google in August, and there's no doubt people on campus are more deserving and could likely have gotten it before me. But GOOG +1 isn't the only way you can highlight Google+ on your license plate, assuming you live in California and have a little imagination. So I ordered GOOG +1. A short 9 or 10 weeks later, the plate arrived, and I enjoyed taking the specialty plate around the offices in Mountain View, to get photographed with many of those who are working on the product. 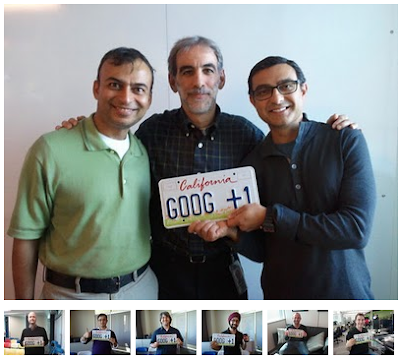 In the photo album I posted to Google+ (of course), you can see Senior VP Vic Gundotra, VP of Software Bradley Horowitz, CEO Larry Page and many others smiling with the plate. It's a little token, but fun. 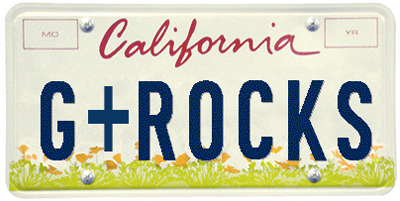 To get your own G+ plate, saying whatever you like, including +YourName or G+ Rocks or whatever you can think up, head to the California DMV, choose a personalized plate, select the Kids plate, and test the name until you find one available. For fifty bucks and a forty buck a year cost, the plate is yours. If you're a longtime reader, you know I have fun with tech and this particular experiment was fun. Do I expect to see scads of G+ license plates up and down the freeway? No. But you can if you like. I'd love to hear your idea and see what you come up with. If you really care about a craft, you'll want to be consistent about it and maintain high quality. That goes for athletic pursuits, hobbies, careers, family, or whatever provides you with reward for effort well done. For me, after several thousand blog posts poured into this site for more than five years, gaps are noticed. I'd like to make up some story about how I took ten days off from blogging out of respect for Steve Jobs' passing, but that'd be nonsense. So would any belief that I'm overworked and overtired. After all, I'm keeping practically the same hours I always have, and I managed to cram an entire four seasons of Mad Men into two-plus weeks of aggressive Netflix watching this month. But the ten day gap is the longest here since starting in January of 2006, and I'm hyper aware of it. What's changed, at least in the short term, is what I consider valuable. MG Siegler, now at CrunchFund and a part-time TechCrunch contributor, wrote a pair of posts in the last week or so on what has driven him as a tech blogger. The first, in homage to the Raiders' late owner Al Davis, was titled Just Win, Baby, and the second follow-on was simply Drive. In these posts, MG talks about how he set goals for himself that he could be satisfied with, whether it be creative headlines, analytical longer posts, scoops or whatever... all elements of a game that contribute to "winning", he writes. Having had a front row seat to MG's ascension, at least the last four years, I understand his view, and recognize his need to find value in his effort. Make no mistake - in blogging, one has to find value in what one is doing, especially as for most there is little to no money it, and those who are the exceptions, TechCrunch included, need a strong combination of skill and luck. With that backdrop, having shifted gears in August and counting Google as my employer, I bump into the occasional person on campus who graces me with a question much like "Hey! Didn't you use to be a tech blogger?" or "I heard you were a pro blogger before joining us." It's almost with some regret that I have to admit I didn't cram my page full of Adsense to make a few bucks, and that I always participated here for the sheer fun of it as a hobby - that I wasn't really a tech blogger, but just one who played one on TV. While it's great the blog created a name, explaining the true backstory, be it through mentioning my6sense or Paladin or BlueArc or something else... you know, real work... takes a bit of time. But as 9 of 10 startups fail, so do 9 of 10 blogs, I'd bet. Many get started and abandoned. Many don't get readership that satiates someone's needs, and obviously, now, participating on social networks is simpler, faster. It's like popping chocolate espresso beans for a quick perk instead of preparing a full multi-course meal. As someone on the outside looking in to some of the tech giants who make news and have the attention of consumers and tech reporters alike for years, be they Twitter, Facebook, LinkedIn, Apple, Google or others, I could sometimes get weary of seeing new hires or established employees at these firms talk about how wonderful their jobs were. Just like nobody wants to read the social status update that "I have the best friends in the world" or "my boss is so nice", few want to hear silly updates about the nuances of your 9 to 5. So I have made sure not do bore you with that here. You don't need it, and I know it won't add value. Similarly, I've always believed in having a good sense for when to speak and when to hold back. I recognize that in my new position, rightly or wrongly, how I comment on perceived competition or rumors carries extra weight. So posts that used to make sense on this blog, such as updated hires at Twitter, comments on the news feed from Facebook, positions on Android or Google TV or other products I like, are viewed in a different light. Also, working within Google and having access to future plans for our product line and sister projects throughout the company makes commenting on trends or specifics a fine line best avoided. Make no mistake - that's certainly not due to any push from the company to have the blog quieted down. As one can see from many other active Googlers online, an open discussion is celebrated and debate is encouraged. In fact, without jumping into specifics, the greatest conflicts with employees at the company is when access to information or locations is in any way unequal. The corporate ethos is to make that information discoverable and for movement on campus fluid. So while there may be some curiosities as to how the blog will morph, nobody would ever expect it to disappear, and the gap is from me - as I'm finding less of a need to talk about what everyone else is doing, and almost no need to overpromote what we are doing. So I watch, I read, and I keep working. As MG writes, one of the driving elements of a tech blogger is the ability to get scoops - breaking a story before the competition or before the company is ready. For a while, I was doing that, being first to introduce many properties to the tech blogosphere. I felt I had proven I could do that, and didn't push as aggressively later, even as some small startups would provide tips. Some more effort was pushed toward gadgets instead of social services, or more arching analysis. Unlike other authors, I always had the day job providing a foundation, so I didn't need to chase sensational stories and headlines, or post with great frequency to meet a quota. In time, I knew that I didn't have to post every day, but when I did, I had to make sure it was good. Some of the best posts are more thoughtful, and don't necessarily break the news - but set the stage for more thought and creativity. Now, at the office anyway, I get to work with a service that has a lot of attention, and help prepare our own equivalent of regular scoops, doing much of what you saw me do here on the outside, on the inside. That helps satiate the need to break the story. It helps keep me connected simultaneously to our users, the news media at large, and third party developers. Hence the decreased need to scratch that itch. Also, as more people are being introduced to me for the first time, through Google+, as a Googler, and not as a tech blogger, I know that I am representing the company when I post, even if not directly, so they may get confused if I profile one startup or another that is unrelated. No amount of disclosures can clear things up for those lacking patience. So that's weighed in as well. Sometimes it's easier just to sit down and watch an episode or four of Mad Men and put it off - that I'll blog tomorrow. It's not that the Drive is gone. It's just on a different course. The world's outpouring of affection for Apple cofounder Steve Jobs is remarkable. In a time when scandal and tawdriness make headlines, and the foolish are revered, Steve represented something else - an intelligent, perfectionist approach to creativity, aimed at the greater good to constantly refine and bring value, through technology - and somehow won the hearts of the people. Amidst a world of awkward poor dressing techies, Steve exuded class and presented himself as being above the fray. His presentations were a masterpiece. His products were art. He took a world consumed with cutting margins and making it up in volume and made it emotional - a status symbol. He helped define a generation of computing and electronics in hardware and software, and became the man on a pedestal by whom all other CEOs and innovative tech leaders are measured - a tall task for the current crop and those to follow. The last 4 or 5 years of uncertainty around Steve's health (and I feel like I know him so well that he should simply be referred to as Steve) were the unspeakable story - the deep hope that he could surprise us all - again - with "One more thing" and show that he had somehow beaten cancer and proven his immortality. All while fighting unspeakable challenges at home and in hospitals, he and his extended team churned out more and more products, hit after hit that built Apple into the highest-valued company in the world. Each keynote worried us that it would be his last. His very figure was dissected by cheap online tabloids trying to score a few million page views, and we rejected the opportunity to have this new shrunken image burned into our pupils, because we knew that despite his newfound frailties, Steve inside remained the lion we all knew. For 15 or so years, Apple and Steve Jobs have once again been whole - practically synonymous. College students everywhere can't remember a time when Steve was not leading the company. But for those of us who suffered during the dark days of Apple, when the word "beleaguered" followed the company everywhere, and showing up with a Mac in a world that was going Windows was a conversation starter, knowing you were different. It's not just that Steve did his job better than anybody else when he was on top. It was that he took a company in the middle of a very public suicide and turned it around, using the perfect mixture of humility when it was needed, and arrogance when it too was needed. During the summer before my junior year in college, I remember my roommate, almost with a cat call, announcing that Gil Amelio, then CEO of Apple for a mere 500 days, had resigned. Yet another obvious example that Apple was doomed, and we would have to settle for something less than great for the rest of our computing days. Even I had almost given up. But this presumed bad news was the turning point that brought the original visionary who made the Mac what it was to the company that could make history again. Almost nobody saw it coming. Not even the geeky among us who said we would give up our Mac when you pried it from our cold dead fingers knew what was coming. Not even those of us who held our AAPL shares in the single digits and cheered when the company market cap passed $4 billion had any idea of what the next decade would bring. If we had, we would have put our life savings on it. Why is the world reacting to the passing of Steve in the way that it has? Why has the President of the United States taken the time to remark on his passing just hours after Steve left us for what's next? Why did the leaders of practically every tech company on the planet express their heartfelt loss and appreciation for the man's accomplishments? Because Steve stood for something. He personalized the fight for the user so absent in a world of drab number-pushers unwilling to take chances. He personally stood for making change for humans that made products desirable. He was, to many, a hero - even to those who found themselves going against Apple in the market. In the last few years, as we've all started to think about the inevitability of Steve's passing, as cancer doesn't give anybody any slack, writers have all had the chance to write their premature obituaries, to share their favorite stories of Steve - to tell their first experiences of the Mac or the iPhone or the iPad or anything else that made Apple have an impact on them. I now have three children who will grow up in a world without Steve Jobs, who will be forced to hear from me stories that make him sound like Thomas Edison and Henry Ford wrapped up into one. I have but the one blip of a memory of when I saw him at an early Apple Store in Palo Alto, when being his perfectionist self, he answered a support question I had. I am glad I saw a keynote of his at MacWorld in person a full decade ago. Even as some of my preferences changed in terms of my own computing and mobile choices, I never lost faith in Steve and his fight. The world lost a vibrant 56 year old man. In a world where people regularly crest over 100 years old, and CEOs melt into their chairs into their 80s, Steve could not beat cancer. There were no karma points for being the best in the world for what he did and being an inspiration to all who saw him, knew of him, came into contact with him, and understood him. And this is just wrong. It is a major reason why underneath all the praise and wistfullness and sorrow, there is also anger, and frustration that a man who had already given so much, who had so much more to give, was taken from us too soon. This is unacceptable. Tim Cook and the rest of the Apple team have an impossible task, to satisfy the millions of Apple fans and the tech world who has grown used to expecting the impossible from the company and seeing it exceeded. I have no doubts that Steve has trained his successor and management team well, that they know the right way to build products and make things beautiful and magical. But in a world of copycats, Steve remained without equal for decades, a cut above the rest. There will be no replacing Steve. Just an end to an era, and the start of a new landscape, where he moves into the history books instead of current events. I do have a heavy heart tonight. I say it without melodrama, without a need for others to feel shared sorrow, but for reality. The whole world lost somebody special today, and we will never get him back.